If Rand Paul doesn’t want Americans to speculate about the neighborhood feud that ended in a neighbor breaking six of his ribs, he has a funny way of showing it. Paul told police that as he was mowing his lawn at his home in Bowling Green, Kentucky, on Friday afternoon, “his neighbor came onto his property and tackled him from behind, forcing him to the ground and causing pain.” Rene Boucher, who reportedly admitted to attacking Paul, was charged with fourth-degree assault and released Saturday on $7,500 bond. The retired anesthesiologist appeared in court Friday, where he entered a not-guilty plea. The senator’s office initially said he was “fine,” then revealed a day later that he’d actually broken five ribs. Since then, Paul has offered fairly detailed medical updates. His senior adviser Doug Stafford said Paul had “five rib fractures including three displaced fractures,” and listed a number of life-threatening injuries that can develop from such injuries. On Wednesday, Paul tweeted that a sixth rib had been broken, too, and that he has a pleural effusion, which is excess fluid around the lungs. Then Paul and Stafford both tweeted out two articles on the root of the dispute between Boucher and the senator, with no additional commentary. An attorney for Boucher has described the conflict as “a very regrettable dispute between two neighbors over a matter that most people would regard as trivial.” Yet, neither side will elaborate on this “trivial” matter. While some on the right suggested that the assault must be related to Boucher’s liberal politics, multiple outlets reported that it involved a long-running dispute over lawn maintenance. Stafford denied this in a statement released Thursday night. “As to reports of a longstanding dispute with the attacker, the Pauls have had no conversations with him in many years. The first ‘conversation’ with the attacker came after Sen. Paul’s ribs were broken. This was not a ‘fight,’ it was a blindside, violent attack by a disturbed person,” the statement said. The Breitbart and Washington Examiner articles Paul and Stafford posted dispute this notion at length. No less than seven neighbors insist that the Pauls are actually exceptional neighbors and citizens, who hold their lawn to the very highest standards. Neighbor Travis Creed called reports of a landscaping dispute “erroneous and unfounded,” but offered no alternate explanation. “The reason for Mr. Boucher’s bizarre attack is known only to him,” he said. The Kellys went on to describe the Pauls’ practice of including neighbors in their annual “Paul Family Football Game” at the holidays. “It is here that Rand and his family welcome any and all neighbors, whether you choose to be a player, a cheerleader or a self-appointed referee you are part of a team. It is here that we join to catch up on our busy lives, to reminisce about our many afternoons at the lake and to reacquaint ourselves with the simple task of ‘being neighborly,’” they said. 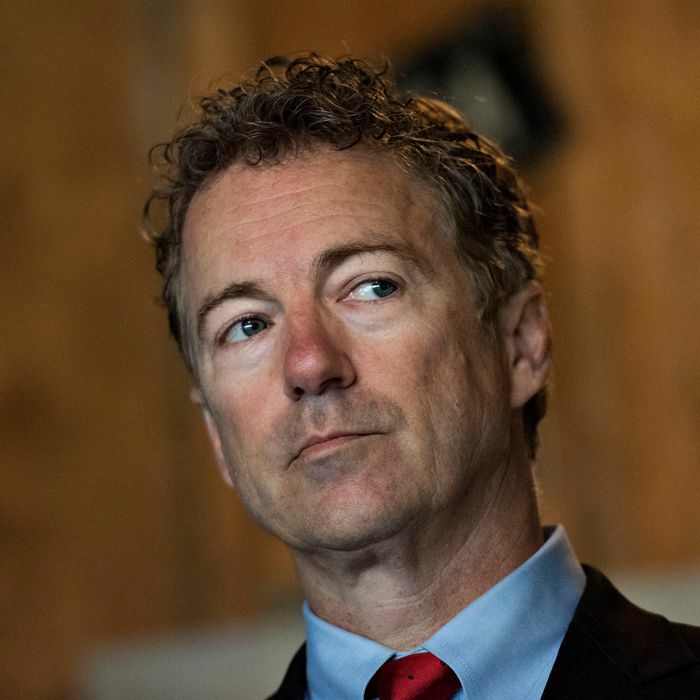 So to recap, we still don’t know why Boucher pummeled Paul, but this recent unpleasantness should not dissuade anyone looking to purchase a home in the most idyllic gated community in all of Kentucky.